I am both humbled and frustrated by how many important skills I still want to learn at the age of 54. I also struggle, sometimes, with the question of how much formal training to pursue in any topic. Yet, when I learned that Pandora Thomas and Lisa DePiano were teaming with Starhawk to offer a Permaculture Teacher Training for Women through Earth Activist Training, I knew I had to be there even though it meant getting on an airplane all the way to California. Every experience I’ve had with Lisa and Starhawk has been rich with new skills and perspectives. And Pandora is someone I’ve been wanting to meet and study with. “Drawing on the wisdom of ecological systems and indigenous knowledge, permaculture offers us a vision, design approach, and tools to create a world of health and abundance. Increased inclusion and support of leadership and perspective from women of diverse backgrounds is vital to this vision. In this unique and innovative program, we explore diversity and leadership while building our confidence. We practice teaching permaculture for various formats, from introductory workshops, special topics, and short courses, to the core permaculture design certificate (PDC) course. One of my practices as a permaculture teacher is to embody permaculture ethics, principles, and design practices in my courses. As you may already imagine, this course did the same. Applying the principles of stacking functions and relinquishing control, as we moved through the curriculum, we students participated in and eventually led activities that modeled, demonstrated, and explained social permaculture techniques. Doing so felt like a growing edge at times but I had decided when I applied that I would live my ethics of being vulnerable and transparent (thank you, Miki Kashtan), and courageous. One of our lessons was that impact matters over intention so I thought about my words and actions more than ever and I’m pretty sure I still blew it a few times. One of our earliest activities was to co-create a Class Code and decide what we would do when or if the Class Code was broken. While one of the purposes of this exercise was to help us consciously design a safer space, it also helped us learn about each other, and to learn some social permaculture tools such as “throw glitter, not shade” and “holding the complexity of intersectionality.” Given that we were indeed a group diverse in race and age, the complexity of intersectionality was a lived experience. Though we were united by identifying as women with permaculture skills, I felt that, at times, we struggled together through the difficulties of differences of opinion. As a cis-woman who benefits from white privilege, I came away with a deeper appreciation for the experiences of Women of Color (WOC) – both those who present as WOC and those who present as white – and the depth of the oppression of living in our current structure of white supremacy. I listened intently as the WOC even disagreed with each other at times. I deeply appreciate that Lisa D. and one of the students co-led an optional lunchtime discussion group on white supremacy to support those who identify as white to learn from and support each other rather than placing that burden on the women of color who were present. I also benefitted from sharing time with a white housemate with whom I could process and explore. During the four days, we also learned and practiced various teaching techniques to support our curriculum development and future work with diverse groups including the diversity of whether folks are visual, auditory, or kinesthetic learners. For example, we used The Gallery Walk technique to undertake a site analysis of the group. Questions written on sticky easel paper were posted on the walls of our meeting space. We were asked to visit each question at least twice during the time allotted and to use colorful markers to write our answers. Then, as a group, we moved from paper to paper for a group harvest – to collectively review the answers, notice commonalities, and ask clarifying questions. A few of the dozens of teaching techniques we learned were: Pair Share, Whirly Tour, Common Ground, Teach Back, and Mingle Mingle. Along with the struggles to undo racism and oppression, we had fun while learning and learned how to make our teaching engaging. For anyone who is considering the value of attending a Teacher Training, I hope that you’ll be as blessed as I was to find a training that not only supports your growth as a permie teacher but also supports your growth as a Citizen of The Earth. I am forever changed and improved by this experience with new skills that I use daily. I also recommend that you are selective about with whom you study. While it’s convenient and perhaps preferable Earth Care to learn locally, our teachers are so influential in our experience that travelling may very well be worth the sacrifices. 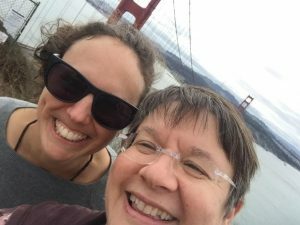 (And maybe you can stack functions like I did – finally hugging a redwood, getting a taste of the California chaparral and other ecosystems, and seeing the wonders of The Golden Gate Bridge. I recommend that you visit PAN’s Educators’ Pledge Signers page to learn if the course teacher has agreed to this voluntary pledge document. If not, ask them if they will. And, as a teacher myself, I’m guessing that if you offered to help put together a committed group of students to make the course financially viable, many teachers would be willing to travel to you!